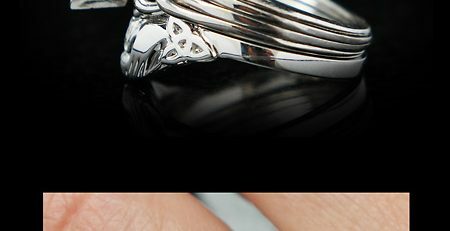 The main factor that governs the weight or gauge of precious-metal stock we need to use for your ring is the size of diamond or gemstone we mount on your ring. Generally, our 4-band, medium-weight, puzzle engagement ring will hold a stone up to approximately 0.72CT, or seven-tenths of a carat. When you opt for a larger stone, we must make your ring sturdy enough to hold the stone securely and to ensure that if your, for example, marquise diamond gets caught on something, it will not destroy your ring as a result of your ring being too light weight. 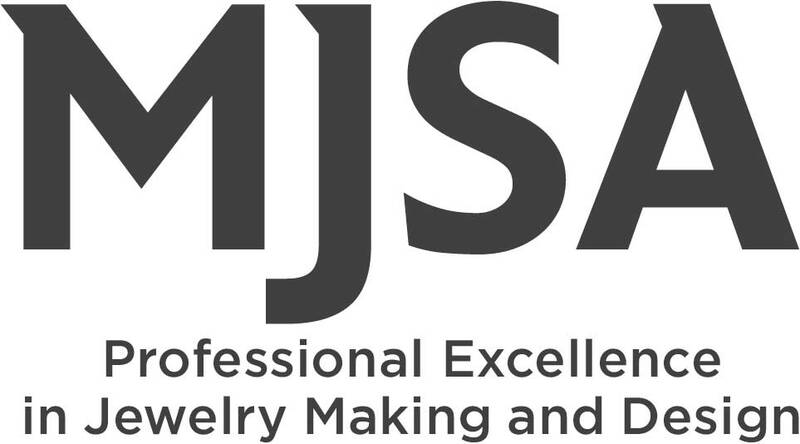 Each weight, or gauge, of stock precious metal, in combination with the weave you select, will offer a different look. 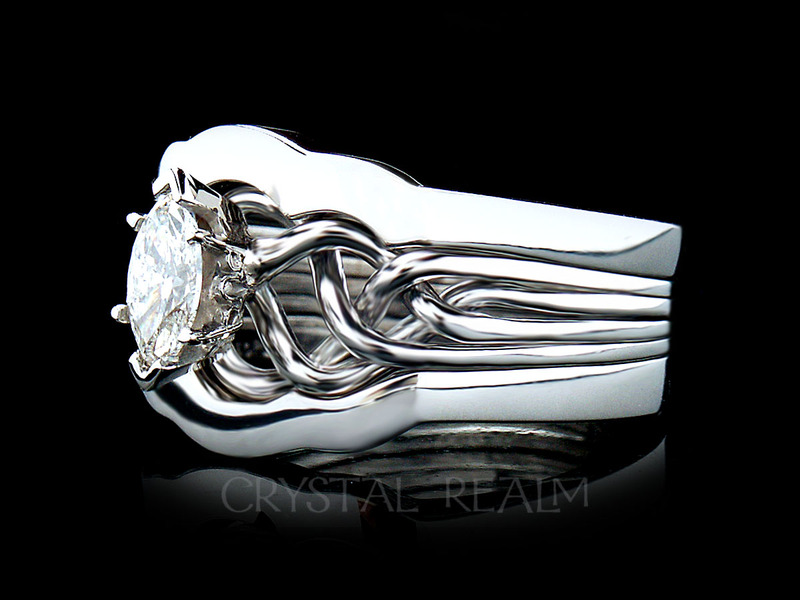 Even when we go to replicate a ring shown on our website or on our “Select your style and weave” page, it will not be identical to the one shown in our image. 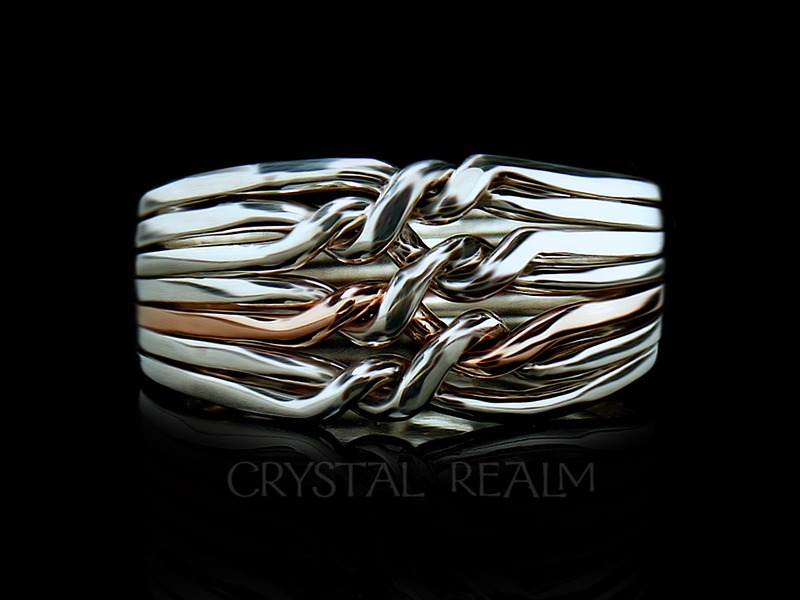 Your ring is hand-woven, and it is a one-off, original, wearable, work of art. 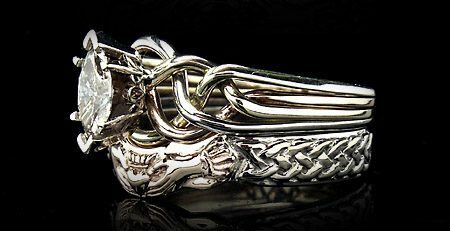 If you look at enough images of these gorgeous rings, you will also become aware that each one is slightly, quirkily, asymmetrical, because of its hand-woven nature. The marquise diamond ring above bears an approximately 0.46CT marquise diamond. 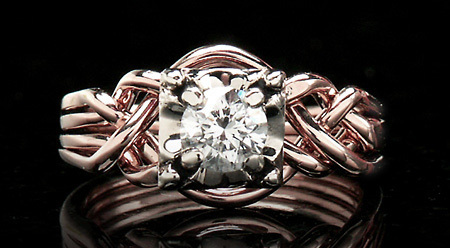 Weight: medium with a standard weave, which will hold a marquise diamond up to 0.72CT. A lot of people fall in love with this set, and, if you do, it’s important to consider the size limitation of the diamond or colored gemstone this set will hold. For a gemstone or diamond heavier than 0.72CT, we must make your ring a little heavier, like the one shown below. 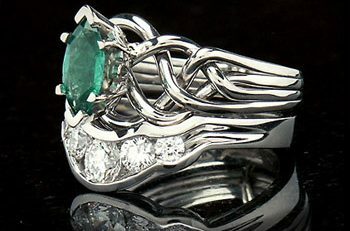 The rare 0.87CT blue-green marquise emerald, above, is too large for a medium weight ring, so we wove this ring with just-over-medium-weight 14K white gold. 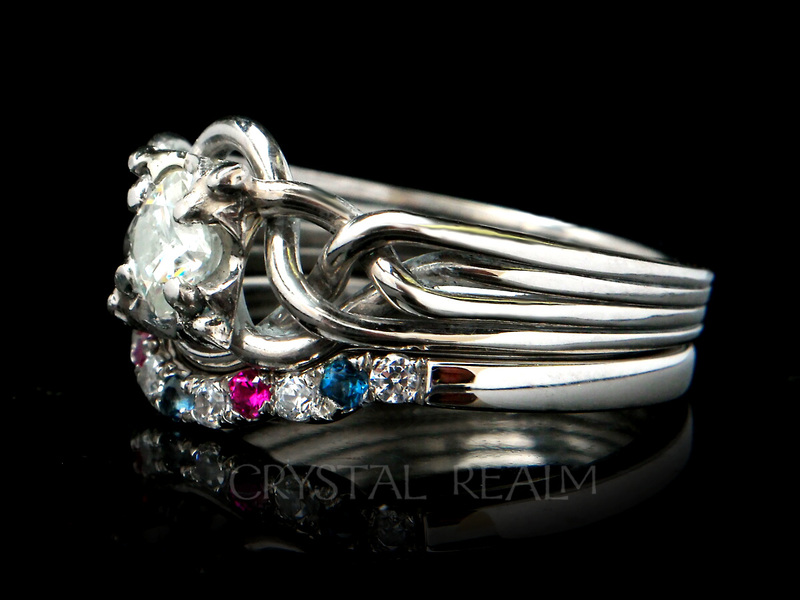 It makes for a bigger ring, especially with the open weave, as shown here, and it is properly sized for the dimensions and weight of the gemstone. The puzzle ring above is made with a 1CT diamond and the same slightly heavier gold stock as shown with the marquise emerald ring, only in this case in three colors – 14K rose, 14K yellow and 950 palladium. 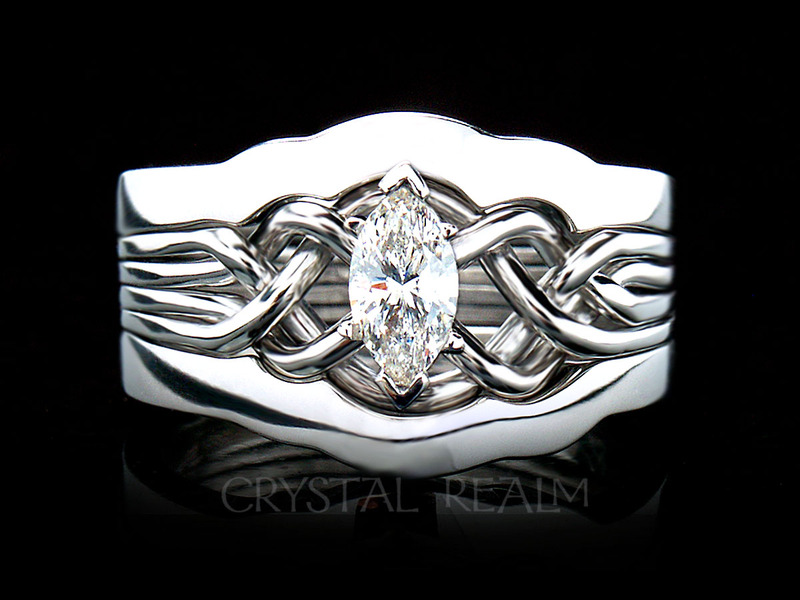 This is a standard weave puzzle ring with a made-to-order claddagh band. Laura on her wedding day in Italy, wearing her Juliet, princess-cut, 1CT diamond puzzle ring, with heavy, 18K yellow gold puzzle bands and a 14K white gold setting. 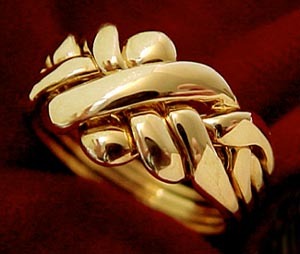 We make almost every puzzle engagement ring in 14K gold, rather than 18K, because it is so much stronger. 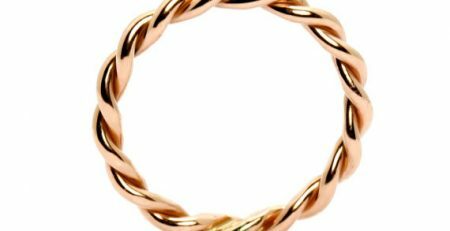 But with the heavier bands comes strength that compensates for the higher concentration of gold (18K gold being 75% gold and 25% other metal alloys). 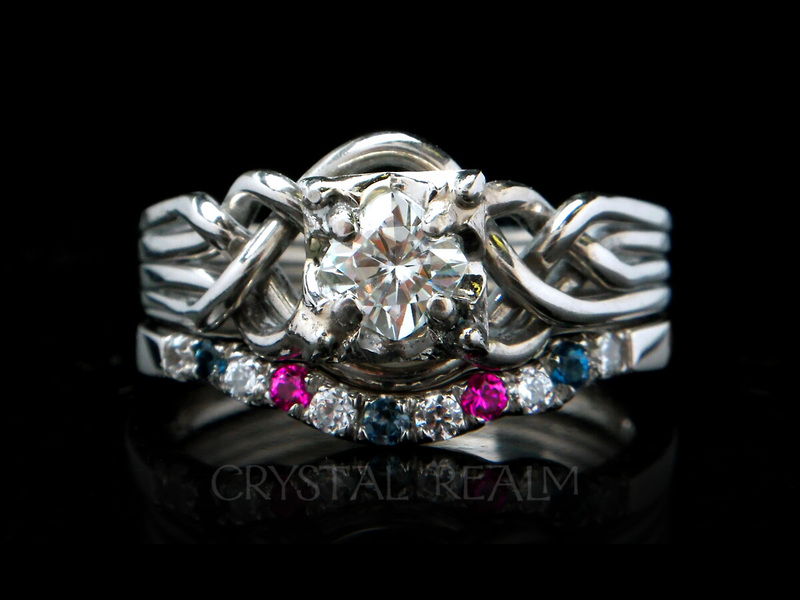 Still, we stick to 14K for the setting, because we want the strength of 14K in the part that holds the diamond. Laura’s ring is about a size 4.75, so her ring illustrates that our heaviest weight women’s puzzle ring looks gorgeous even in a small finger size. 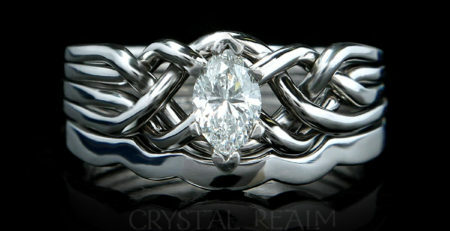 We are just about to redo Laura’s setting with our new Celtic triskele diamond setting, shown in a CAD rendering below.